Max Hannemann (1899 – ?) was a member of the Communist Party from 1931. As the political leader of party branch, he organised resistance groups. 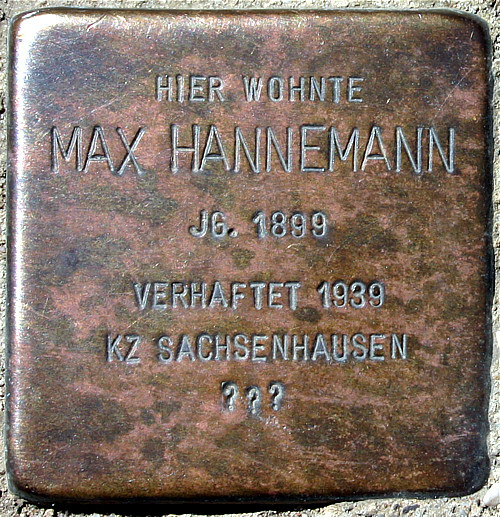 In 1934 Max Hannemann was arrested and sentenced for high treason to 5 years' imprisonment. In 1939 he was sent to Sachsenhausen Concentration Camp. His wife last heard from him in February 1945. After that, his trail is lost. 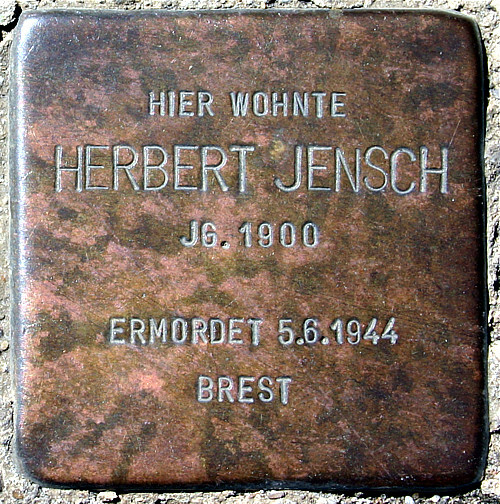 Herbert Jensch (1900 – 1944) lived from 1920 in Frankfurt and was a member of the German Communist Party (KPD) and from 1929 a KPD member of the city parliament. He was arrested after the Reichstag fire, and released 19 months later. In 1939 he was conscripted to the navy. While stationed in France, he got into contact with the French resistance. The Nazi formation SS murdered him in the open street in Brest (France).